When life gives you rainy days, why not wear cute boots and jump in the puddles? 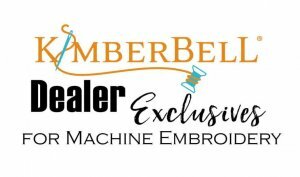 Or, just stay inside and stitch a pair of darling rain boots on your embroidery machine! A layer of vinyl makes happy cotton prints appear like real rubber boots. 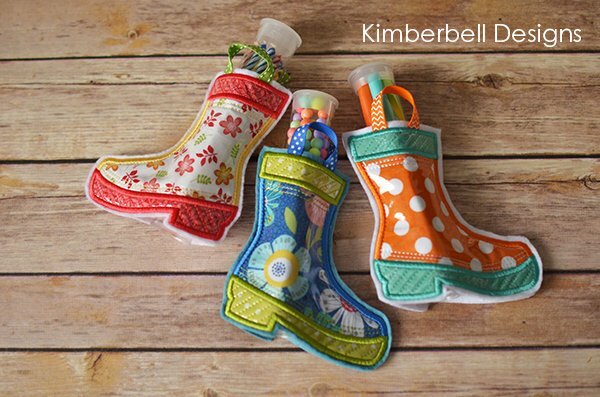 Kimberbell's Medium Sweet Tube slips inside each boot with darling ribbon straps. To encourage a friend who is weathering the storms of life, we've included a printable PDF with five gift tag options. - Fabric 1 (Boot): cut (2) 5-1/2" x 5-1/2"
-------- Collar: cut (2) 2" x 3-1/2"
-------- Outsole: cut (2) 2" x 5-1/2"
- Vinyl (Rubber Boot): cut (2) 5-1/2" x 5-1/2"
- Felt (Shoe Background & Back): cut (4) 6" x 6"